We begin with tragedy. Three siblings, Sita, Raju and Rano, are orphans. A Police Inspector (Iftekhar) has helped them, and they proudly show him the school medal that Raju has won. Sita, the eldest, works hard to make sure that Raju and Rano study and are properly fed. 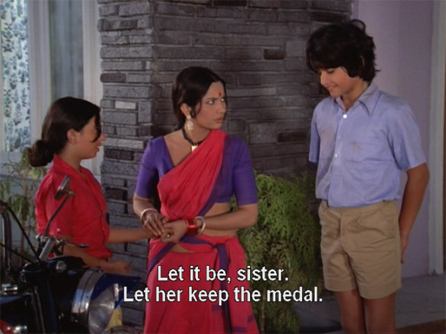 Rano mischievously takes the medal from Raju and Sita tries to wrest it back. That night, while the other basti residents are at a song performance (which is intercut with the unfolding events outside), the siblings’ lives are turned upside down. Sita, the eldest, is attacked by a notorious criminal, Michael (Kamal Kapoor). When her younger brother Raju tries to help her, he falls into a sinkhole and slips underwater. Seeing this and unable to help him, Rano, the youngest girl, tries to help Sita too, but fails and Sita is killed. Rano herself flees in fear of Michael, thinking that Raju is also dead. It’s very compelling and extremely grim, and I’m already on the verge of sobbing, four minutes into the film. Raju is rescued, however, and hasn’t drowned. The Inspector takes him in and Sita is cremated. Alone, scared, and hungry, Rano is adopted by a smuggler and grows up to be Rani (Zeenat Aman), a thief who wears her brother’s medal in a locket around her neck. 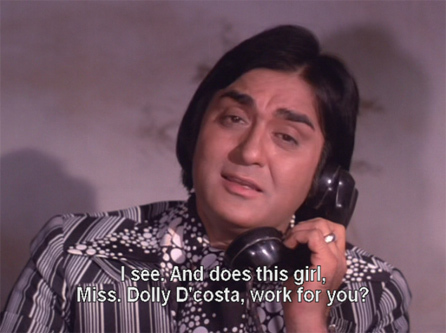 Raju (Sunil Dutt) grows up to be a CID officer, making his adopted father proud. He is engaged to marry Asha (Reena Roy) but is reluctant to get married until he finds Rano, whom he has been searching for his whole life. 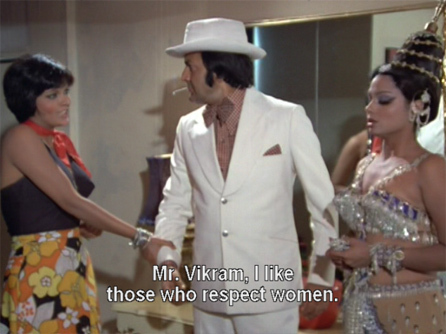 Meanwhile in one of those filmi coincidences we all love, Asha’s brother Dr. Ashok Roy (Sanjeev Kumar) meets Rani in the guise of Vanita during one of her scams and he is smitten. She gives him a false phone number and escapes, but she is about to lose her independence. She is forcibly recruited into a notorious gang. Vikram takes her to their lair to meet Boss and his other henchmen. 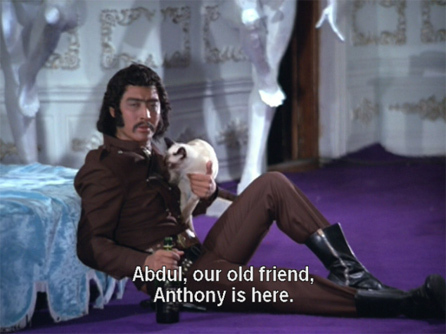 Rani is assigned a roommate at the Hotel Volga, the hotel dancer Miss Kitty (no, not Helen, I am pretty sure it’s Padma Khanna even though imdb says Padma plays another character named Dolly). 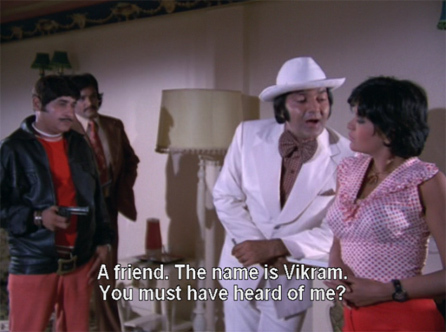 Kitty is a reluctant member of the gang too, and gives Vikram some backchat. When he grabs her threateningly, Rani comes to Kitty’s aid. You can almost see the bond between these two feisty women cementing! 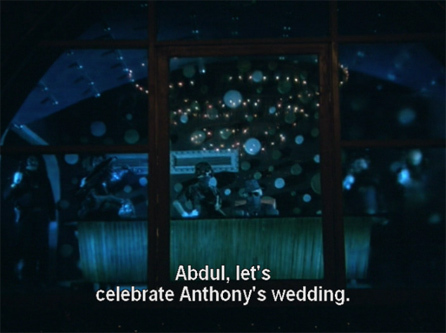 That evening Raju and his father have dinner with the Roys. Ashok and Raju get into a discussion on criminal reform, with Ashok saying that you can cure a criminal with compassion, but punishment will never change him. He doesn’t know about Raju’s past, so is surprised when Raju explodes in anger. Rani manages to knock Laila out and escape, but the police are close behind and chase her into a building where…you guessed it! Dr. Ashok has his practice. She takes refuge there, and he puts two and two together pretty quickly. He is undaunted though, even when she pulls a gun on him. She bursts out at him as Raju did earlier, for the same reason—trauma at seeing her sister raped and killed along with her brother (she still believes he drowned of course). Ralhan does such a nice job showing the psychological effects of trauma, and how people are affected even decades later by it. Anyway, Ashok helps her escape the police dragnet and tells her that he wants to see her again. 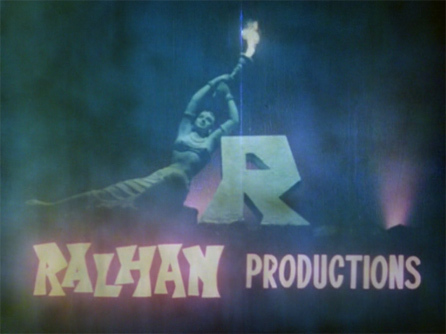 Ralhan is also in the film, playing a photographer named Rocky who is dragged into the jewelry heist case. He is in love with Dr. Ashok’s secretary, Dolly, whose father (Moolchand) disapproves of him. Look at Raju’s suit here! Aaaaarrghh! 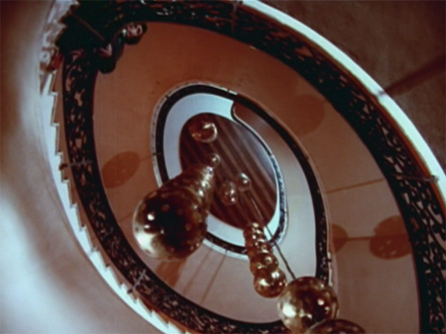 Rocky took photographs as the heist was taking place, and Raju ropes him into the investigation to help out. Meanwhile, Rani has contacted Ashok again, having fallen in love with him by now. As Raju draws closer to Boss and his gang with the aid of Rocky’s photos, will he catch Rani? Will he figure out that she is his sister? Will Rani figure out that he is her brother? Can she be rehabilitated by Ashok’s love? Will I get through it without crying? And who is Boss, anyway? For all the answers, see Paapi. It’s long, with an over-complicated plot, but it’s good masala fun with some nice songs by Bappi Lahiri before he went overboard on disco. Posted on August 12, 2008 at 11:23 am in Hindi movies	| RSS feed You can skip to the end and leave a reply. woow! the furniture in this movie just made my eyes pop! they are sooo cool, poor danny but atleast he has a cat! i wonder if iftikar went to sets dressed as a police inspector all the time, hmmmm invisible beard stroking! 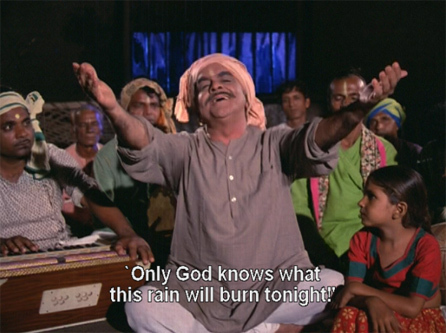 Filmi Girl: Were you watching with sunglasses on??? :-D The OTT style is one of the charms of 70s films though, although I admit I screamed out loud when Sunil came on in that black and white stripes and bubbles combo. Wow, this is so weird! Last night I was watching a song from Paapi on YouTube and thinking to myself, “I NEED to get this movie!” Sanjeev and Zeenat are among my all-time favorites, and I really enjoyed them opposite each other in Manoranjan. What did you think of their chemistry in this film? And 70’s pre-disco Bappi was great! Ooh Sy, good point about Zeenat and Sanjeev in Manoranjan. I even wrote about it here on my blog! Yes, they are cute together, she’s so feisty and he’s so gentle, they go well together. Thanks for the post and colorful screencaps! I’ll have to check this one out, too…it looks like a lot of fun! Love Danny, was his role meaty enough here? Saw him in a Bengali film with Tanuja called “Lal Kuthi” set in the tea estates of Darejeeling where he had a great role. Quite different from the usual stuff he was saddled with. I think he either produced or scripted it and considered it his best film. Did you know that he and Jaya Bhaduri were in the same batch in the FTII in Pune? And that she and he were always vying for the top place in class?! Sorry for the typo. It’s Darjeeling. Heh, I did know that. discovered this blog 2day and fell for it instantly as I am a bollywood fanatic too though my era starts in 80’s.. ;)..keep up the good work..
Must see it. I love Sunit Dutt’s suits. That’s half the fun of watching these films, isn’t it? How I miss all the atrocious dressing with most actors being dressed up in a bland designer way most of the time these days. pranay: thanks! I’m glad you enjoy it. I haven’t written much about the 80s since I haven’t seen a lot of films from that era yet. but it looks like same outfit the above picture of dancer – so padma khanna is the dancer! Plus, Zeenat had a new hairstyle in every scene. Right from the opening scene of the villain watching that woman take an open-air bath, I knew it was downhill from there. 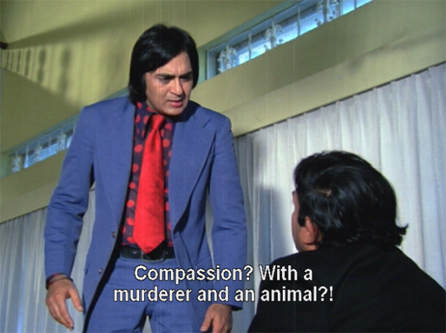 Amrish Puri voicing the villain was somewhat amusing. Noooo…I loved it. It is campy masala goodness. usually i am not interested in bolliwood satff, specially now what they makes garbage as films..
yes bappi lahiri was very good in composition before his disco era!! The only time Reena Roy and Zeenat Aman starred together. Someone correct me if I am wrong?? VINDER MINHAS,JALANDHAR CITY PANJAB . Minhas35@yahoo.com. Pappi instead of last alphabet you put u it will be my nickname,anyway comming back to movie ,Pappi was feb1977 release,though already comlete in 1975itself,the movie did not got released in 1975 due to emergency got imposed and the subject was such,that it was held up and got only released after emergency was lifted,back to movie this one was crime subject certified with ,A,certifacte abely directored by OP RAHALAN,who could be also inculeded into one of natural commidian,though he worked only his home productions. This one too on bigger canvas and he extracted the best performances from all,be Dutt uncle,sanjeev uncle,Zeenat aunty,reena aunty along with alka/padma auntynot to forget iffi da,madi da and Prem uncle,this one was high pitch and moved with diveling speed,not to forget danny uncle with almost similar getup that he had in “36ghante”1973.to justify such huge starcast and equal justice with each role was an achievement by itself,Bhappi da too gave hit music with each song is remembered even today,nowhere from word go to last frame it looses it pace,truly fine effort by Ralhan uncle since more or less hedid not any movie,except one and that was pyaas 1982 with Zeenat aunty.